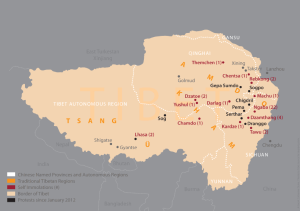 China’s harsh policies in Tibet, restricting freedoms and basic human rights, have intensified Tibetan grievances and exacerbated the resentment felt across Tibet. Thousands of Chinese troops are currently stationed in Tibet and monks and nuns have been subjected to harsh ‘patriotic re-education’ programmes. Tibetan students have been sentenced to long prison terms for advocating for the right to use their language. 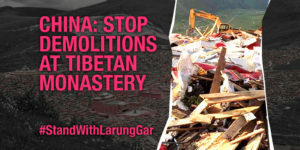 China’s crackdown on freedom of religion has resulted in the eviction of monks and nuns from world-renowned Tibetan buddhist institute Larung Gar, and their homes being demolished. Since 2009 this resistance has taken an unprecedented turn as China’s failed Tibet policies have provoked a wave of self-immolations. 150 Tibetan monks, nuns and laypeople have set themselves on fire to demand freedom for Tibet and the return of the Dalai Lama. Friends and families of these Tibetans have been detained and interrogated. Nine Tibetans-in-exile have self-immolated: six in India and three in Kathmandu, Nepal. Learn more about the self-immolations and the people involved. Learn more about what media is available to help the cause. Learn more about what’s happening at world famous Tibetan monastery Larung Gar.